I have been taking my toddler to Evensong. He's a good sport about it. Mostly. He's thumbed through a few Books of Common Prayer in his time. (We may have inadvertently crinkled a few pages in a prayer book at your church. If so, please accept our apologies!) He's less interested in the hymnal. Usually he has a soft animal or something of the kind, too. Maybe an emergency vehicle. 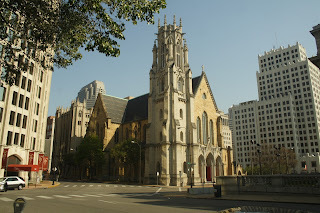 The very first Evensong we attended together must have been at St. James's Episcopal Church in Richmond, Virginia. It was a full house that day, and I had to carry him through the gallery in his infant carseat. It was crowded. People made room. I was the weird dad who was bringing his baby to Evensong. He could only have been three months old, tops. He had heard me sing before. Heck, I did it the day he was born. But that was the first time he heard me sing in a room full of other people singing. His whole face lit up. I could read the joyful relief on his face. It was like, "hey, dad's not crazy! He's just doing this thing that other people do!" It was a pretty great first outing. Other services were not so glamorous, or well-attended. And often on these occasions he was more unruly. He was noticeably unimpressed with my singing and would sometimes sabotage my efforts to manage a hymnal. I mean it's not like Sunday morning where someone is going to very helpfully let you know about the nursery (sometimes with transparent motives). It's Evensong. There's probably not any childcare because, I mean, come on, who brings a baby to Evensong? As it turns out, we've actually been doing this fairly regularly for a couple years at this point. "Evensong!" He likes the word. He was proud to say it. He knows what it's about. I don't know about you, but it's pretty easy to get to Evensong where we live. Here in St. Louis if it's the first or third Sunday of the month we can head over to the Church of St. Michael & St. George. If it's the fourth Sunday of the month we can go the Cathedral downtown. And this has the added excitement of seeing the Gateway Arch through the front windshield now that his carseat faces forward. ("Arch!" I hear from the back, the first time it slides into view.) Other parishes in town have Evensong services on occasion, and we try to take those in too. And, heck, he can even come to my place (but his mom has to sit with him) if it happens to be the second Sunday of the month. And I thought this was all just in good fun until this last time. But something changed for us. It became real. I should have known something was different when he said "Evensong." He has more and more to say these days, and it was exciting to hear him say this word. But there we were in the service, and we got to the prayers. And that's when it happened. Now, mind you, we say the Lord's Prayer at home. Or, more accurately, I say it while he listens. But it's part of the bedtime routine, just like brushing teeth, and you can't really be sure how much of that is sinking in. But we say it at home; we don't sing it. And it never really occurred to me that this little person on the kneeler to my right would remember all these words so clearly in a gothic cathedral downtown, recognize what was going on, and spontaneously join in on a monotone with the rest of the congregation. There's a phrase I use a lot, and I am quite sure that I stole it from someone, but I can't remember who. And Google is no help here at all. So maybe I made it up, but I don't think so. And that phrase is this: "God's very being draws praise from our lips". After all, what is it that causes people everywhere, from the countryside to the big city, to get up early in the morning, gather again in the afternoon, and even late in the evening in some places to sing praise to God? If the morning church service still bears the cultural residue of institutionalized/secular religion – a service of "duty" if you will – Evensong has long enjoyed freedom from this – a service of "delight". At Evensong there is no Baptism or Communion. In most places there's no sermon either. 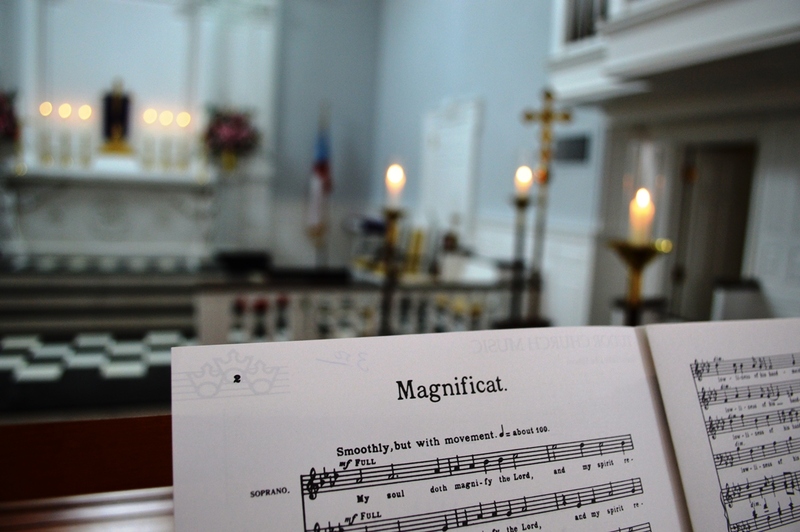 The liturgy and the music are the order of the day. They stand alone, without "ulterior motive". They are their own sacrament, in a way. This is an incredible place – physical, temporal, spiritual – in which to be. Evensong is a real gift to our harried age. And so I hope that if you see us or your friendly neighborhood toddler mishandling a prayer book at Evensong you will remember that "Christ doth call / one and all", even the tiny and small. And if you love Evensong maybe you'll be inspired to invite a young (or any-age) person to go with you (there are often snacks afterward). Or maybe you'll simply consider going yourself if you haven't already made a habit of it. Obviously I don't know if my son will still find Evensong interesting next week, let alone next year. I sort of hope he does as he grows older, but mostly I hope that he finds something like this that he genuinely loves and that feeds his spirit. I know that I have really valued these times I have spent in worship with him in the late afternoon. For us, the primary reason is one of logistics: since I am a professional church musician, we don't have the opportunity to share the same pew on Sunday mornings very often. And I know that, yes, God's very being draws praise from our lips, but it certainly helps if someone will teach us some words.